Android device is one of the common mobile tool nowadays to access email and internet while on the move. To be able to access browsing sessions between PC and Android is surely a feature that will help us a lot. With an extension/add-on called TabCloud, resuming your saved session where you left it is now very possible. The extension does not just allow you to save current sessions to be opened for later use, it also synchronize with your Android device with its Android app. To use the extension/add-on, you must have a Google Account. 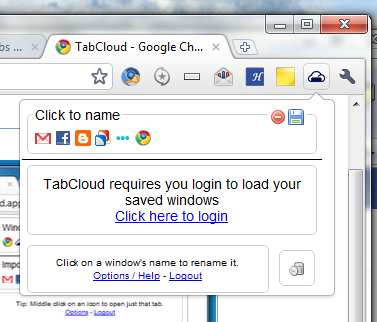 Once TabCloud extension is installed in Firefox or Chrome, you can login with your Google account and access it from the TabCloud icon next to the Address Bar. A click on the icon allows you to save the current session, delete saved session, and open stored sessions. You can also utilize favicons to easily recognise saved websites. Even though it currently synchronize with Android, the developer plans to also support iPhone in the future release.